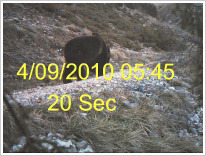 Footprints in snow and in mud and excrements have been detected in late March; on April 9th Brown bear was filmed by one of video-traps installed by wildlife technicians of Studio faunistico Chiros, as part of the census and monitoring activities of large carnivores planned in the Life Ex-Tra project. Brown bear is object of systematic monitoring from September 2006 to present. The activities undertaken under the Life Ex-Tra project provide a better knowledge of his movements and to assess effectiveness of conservation measures put in place still now. Click here to get visualize a short video (20 sec. ).